The liner notes states that this CD is a ‘musical tribute to four composers who served under the British flag [during] the First World War’. The discovery of Kelly’s Elegy inspired the St George Quintet to create a theatrical performance of music and story to follow his life. The CD presents the ‘core pieces’ from this project. Clearly this mission does not include Lennon and McCartney. The only problem I have with this scheme is that all four of the ‘classical’ pieces were not originally composed (or arranged) for string quintet (violin 1, violin 2, viola, cello, double bass). Frederick Septimus Kelly (1881-1916) is the only composer represented on this disc to have been killed on active service. This ‘Boy’s Own’ character (he was a larger-than-life Australian-British musician and sportsman) was killed in the last days of the Battle of the Somme. The moving Elegy in Memoriam Rupert Brooke was dedicated to his friend who died from sepsis aboard a hospital ship off the coast of Greece on 23 April 1915. It was composed for string orchestra and harp. The Elegy has been recorded in its original version on Dutton Epoch CDLX 7172. This version for string quintet by Bram Decroix is effective, moving and quite beautiful. The liner notes suggest that RVWs ubiquitous English Folk Song Suite (or just Folk Song Suite) displays the ‘youthful enthusiasm of new army recruits changing to melancholy and homesickness after months on the battlefield.’ Certainly, war was not in Vaughan Williams’s mind when he wrote this work. I believe it was quite simply the melodies that inspired him. I concede that it was premiered at the Army’s Kneller Hall in the military band version, but that does not make it a ‘war work.’ Subsequent arrangements were made for full orchestra (Gordon Jacob) and brass band. Sir Edward Elgar (1857-1934) was fifty-seven years old when the war began. It is true that he signed up a special constable in Hampstead and later joined the Hampstead Volunteer Reserve of the Army. This latter outfit was the Great War equivalent of ‘Dad’s Army’ or the Home Guard. That said, the deeply-moving Elegy, originally for string orchestra, was written in 1909, probably in memory of August Jaeger, his friend, who had worked at Novello’s. Clearly it is not a wartime work. To my knowledge there has never been an ‘arrangement’ for string quintet. It is a short, tranquil work that expresses both grief and positive hope. Moving on to Arthur Bliss’s Music for Strings. The notes correctly point out that this work is ‘brimming with nervous energy’: The Quintet used ‘the first movement to evoke the atmosphere of a battle.’ Bliss had a difficult war: he was gassed, wounded, lost his brother Kennard and witnessed great slaughter and injury on the battlefield. He did try to exorcise these experiences: Morning Heroes and the Suite for piano point to this process. On the other hand, Music for Strings is not a battle symphony. It was composed in 1935, shortly after the death of Edward Elgar. It is a masterclass in string writing that reflects a romantic, passionate take on life. True, the composer would and could never forget his wartime memories, but in this work Bliss appears to be concentrating on becoming Elgar’s successor. There is no version of Music for Strings arranged for string quintet (that I am aware of). I imagine the St George Quintet played it from the string orchestra parts. I have not seen the score, but I guess there are some divisi parts, which must have caused a few problems for a string quintet. The Lennon and McCartney song arrangements are enjoyable. There is no suggestion as to who arranged these numbers. The tie in for this disc is that a) The Beatles are another kind of British Legend, and b) if you sing (or play) ‘All you need is Love’, then all the world’s conflicts will simply vanish! It is all very well to chant ‘Make Love, not War’ – however everyone needs to agree to that philosophy, and that is why I guess that there will always be a need for that first group of legends, the British Armed Forces. All these pieces are enthusiastically and thoughtfully played by the St George Quintet. Occasionally there are one or two problems (in my opinion) with intonation. 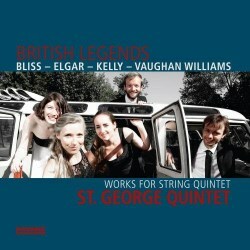 For some listeners this CD may well serve as an introduction to a selection of splendid British music. Hopefully some will go on to discover each work in its original incarnation, including the Beatles! The Quintet are to be thanked for their timely tribute to the ‘fallen’.